Early marriage – in some cases involving children as young as seven or eight – continues to be widespread in the Amhara Region, as is marriage by abduction. For some families, the bride price they receive for marrying off their daughters may seem like the only way out of destitution. However, for these young girls the effects are devastating. Bahir Dar in north-western Ethiopia is one of the country’s biggest and fastest growing cities. Its population is roughly 222,000 and it is the capital of the Amhara region, which is predominantly agricultural and marked by severe poverty. Rates for adult literacy – that is, the percentage of people who can read all or part of a sentence – are 54 per cent for men and just 25 per cent for women in Amhara. Even though the legal age for marriage in Ethiopia is 18, around half of all girls in the Amhara region are married off before they reach the age of 15. Female circumcision is also widely practised. Although in recent years, government programmes have made some inroads into delaying marriage, thousands of girls continue to be affected. Child brides are mostly denied an education, and giving birth at such a young age can have severe health effects. Women have an average of 5.1 children in Amhara. Only around 15 per cent of women use any form of contraception – one of the lowest rates in Africa. These figures are some indication of the great deal of work that remains to be done, both in terms of providing health care and support for struggling families, as well as education and awareness-raising. Due to unemployment and the great poverty of the region, many families struggle to provide for their children. 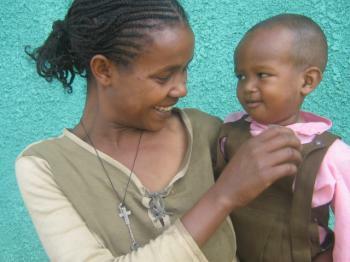 At 94 per 1,000 live births, Amhara has the highest rate of infant mortality in the country. In addition, stunting – that is, being shorter than the age-appropriate height – is a direct effect of poor nutrition and affects 56.6 per cent of children under the age of five in Amhara. While in times of prolonged drought the suffering of the population can reach extreme levels, even in “normal” years, malnutrition, stunting and wasting affect thousands and thousands of children. Mothers from poor households often have to return to work in the fields when their babies are just a few months old, so proper weaning does not take place and the baby’s health quickly declines. SOS Children’s Villages began its efforts in Bahir Dar in 2000. Today, our social centres here provide a family strengthening programme to members of the local community. The programme aims to help parents develop their capacities in a holistic and sustainable manner, to achieve self-reliance and economic autonomy, and to ensure access to essential services such as health care and education. We provide guidance on income-generating activities, psychological support, as well as health counselling for people affected by HIV/AIDS. The social centres also offer day-care, where children are looked after while their parents are at work. The overarching aim of these services is to support families, and the community as a whole, so that children can be protected and will not lose parental care. For those children from the region who are no longer able to live with their parents, twelve SOS families can provide a loving home for up to 120 children. In each family, the children live with their brothers and sisters, affectionately cared for by their SOS mother. 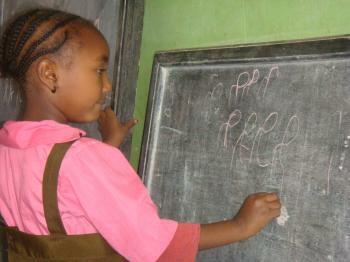 Together with children from the community, they attend the SOS Kindergarten here in Bahir Dar. This way, children from SOS families are integrated into the local community from a young age. The children then continue their education at the SOS Hermann Gmeiner School here, which offers primary and secondary school education to around 480 students.